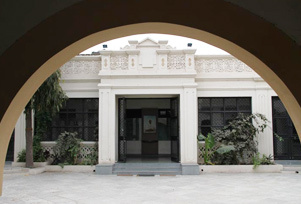 Kaba Gandhi No Delo, literal meaning Kaba Gandhi's house (Mahatma Gandhi House), is a place where Mahatma Gandhi spent early days of his life from 1881 to 1887AD. Situated on the Ghee Kanta Road, the house was constructed in 1880-81 AD as the house of Mahatma Gandhi's father, Karamchand Uttanchand Gandhi (Kaba Gandhi), who at that time was serving at the post of Diwan to the King. For millions of Gandhi followers, this place is nothing less than a shrine. Kaba Gandhi No Delo is a beautiful house that offers a tantalising glimpse into Mahatma Gandhi's early world. The house is built in a Saurashtrian style of architecture, with arched gateways and courtyards. The beautiful building contains many original items related to Mahatma Gandhi like photographs, objects and his personal belongings. The photographs that line the hallways of the house give a peek into the journey underwent by Mahatma Gandhi. The Mahatma’s passion for the handloom is preserved in the form of a small weaving school. Kaba Gandhi No Delo is currently managed by the Non-Government Organization, who also runs classes in sewing and embroidery for young girls within the premises. The place is must visit for Gandhi followers and avid history lovers.